The oatmeal gives the cake a chewy moist texture, and the combination of chocolate chips and walnuts will make this dessert a family favorite. With oatmeal as the main ingredient of this cake, you’re on the right track to serving your family a fairly nutritious dessert. The addition of the Sephra Dark Chocolate Chips and walnuts makes this dessert downright health food! Pour boiling water over oatmeal. Add butter. Let stand for 10 minutes. Add sugars. Mix well on medium speed. Add dry ingredients to wet ingredients. Mix well. Fold in half the chocolate chips. Pour batter into a well greased and floured 9 x 13 pan. Sprinkle chopped walnuts and remaining chocolate chips on top. Bake in preheated 350 degree oven for 40 minutes. *I always opt for the old fashioned oatmeal when possible. It is less processed and has more of the ‘good stuff’ in it. If you have not had the opportunity to try our Sephra Chocolate Chips for baking (and of course chocolate fondue), I would really encourage you to do it! I am somewhat of a chocolate chip conousour… Yes, it’s a tough job, but if you work at Sephra you have to taste test A LOT of chocolate chips. 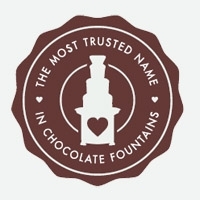 So, we know good chocolate. I can honestly say if you opt for our Premium Chocolate – you will love it. It is super delicious and made in the USA. If you try our Belgian Chocolate you are tasting THE best chocolate in the world. Begium is known for fabulous chocolate. Our Sephra Belgian Chocolate is truly amazing, whether you are using it as fondue chocolate, baking chocolate or just eating it out of the bag (like we do).